My computer has Windows XP and this MFC-J470DW printer doesn't connect to the internet, yet it says it's for XP. Please help? I want the original Brother MFCJ470DW printer cartridges. What's the price? We currently sell both genuine Brother MFC-J470DW ink cartridges and cheaper compatible versions. The original Brother MFC-J470DW ink cartridges are pictured in the official Brother packaging and have the Brother logo under the product images. Any item described on our webiste as "Genuine" is a brand new and original Brother MFC-J470DW ink cartridge. All of our current prices on genuine Brother MFC-J470DW cartridges are shown on the right-hand side of this web page. Do you have black and colour compatible inks for a Brother MFC-J470DW and at what price? Thank you. 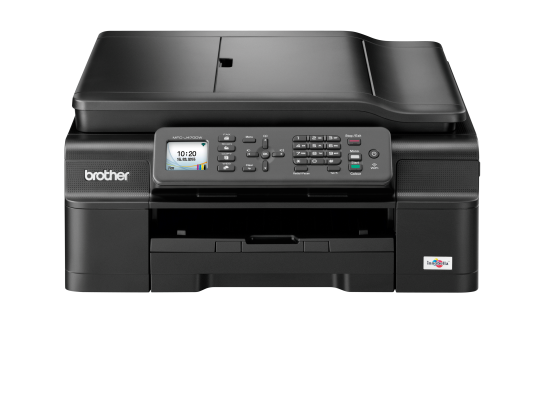 The Brother MFC-J470DW wireless colour inkjet all-in-one with fax is an economical and user-friendly colour printer for the modern workplace. The Brother MFC-J470DW inkjet printer is a truly budget-friendly choice with built-in cost-reducing features to help save resources, energy, and ink, plus convenient direct printing capabilities from a wider range of devices. However, the low monthly duty cycle of the MFC J470DW multifunction printer can be a problem for demanding work environments. This 8.61Kg printer has fax, scan, and copy functions built into its 7.1-inch tall, 14.7-inch long, and 16.1-inch wide frame. The input tray can handle up to 100 sheets of plain paper at a time, while the output bin can handle up to 50 sheets. The standard interfaces of the Brother MFC-J470DW wireless inkjet printer are wireless 802.11b/g/n and high-speed USB 2.0. The operator panel is distinctive for the 1.8-inch colour display screen, but most on-board operation is carried out by the cluster of input and navigational buttons that belong on the Brother MFC-J470DW colour inkjet printer. Users can lower their overall printing costs because the Brother MFCJ470DW colour all-in-one has two-sided printing, high capacity ink cartridges, and support for mobile printing. Free Cloud apps simplify tasks like document capture and conversion, while wireless connectivity allows direct connections with online web albums and services like Google Drive, Flickr, Picasa, and Facebook. Colour printing is fast, at up to 10ppm, while monochrome documents can be produced at speeds of up to 12ppm. The Brother MFC-J470DW MFP uses a four-cartridge ink system, so only an empty MFC-J470DW print cartridge needs to be replaced to help save resources and money. The operator panel of the MFC-J470DW A4 inkjet printer is small and cluttered. It could have been better with a larger display screen. The fax modem is slow and outdated, with speeds of only up to 14.4Kbps. Also, it doesn't have call waiting and fax forwarding features. The Brother J470DW colour multifunction printer is rather bulky and might take up too much space on a standard-sized desktop.